NOTE: The CEC in Windsor main doors close at 4:30. 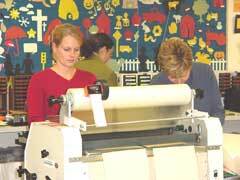 Teachers use our LARGE WORKSHOP to produce their own learning materials and teaching aids. It is also a great place to network and share ideas. Staff are always available to assist teachers with the workshop equipment. Our laminators have extra heavy duty lamination that is very thick and does not peel. We also have a 48" laminator for large maps etc. CHARGE-BACKS: The use of Bristol board, paper, glue, markers, book-binding coils, die-cut felt, etc. are free PROVIDED THEY ARE UTILIZED AT THE CENTRE. There are nominal charge-backs to the school, however, for lamination, badges, fadeless bulletin-board paper, magnetic sheets, steel rings and velcro.